Anytime your drill involves less than 5 on 5, it takes away help and congestion and forces the defenders to be more accountable. 3 on 3 drills are a good way to do that. Today’s post involves 3 3 on 3 defensive drills from a collection put together by Nate Hill, Assistant Boys Coach at Colonel Crawford High School in North Robinson Ohio. He has coached for 18 years from 7th grade through Varsity Head Coach. 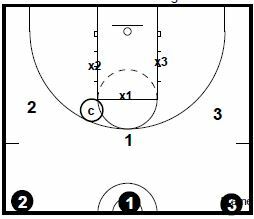 Coach Hill has provided several drills and has been generous enough to allow me to post them on the site. He has also started a basketball coaching newsletter. 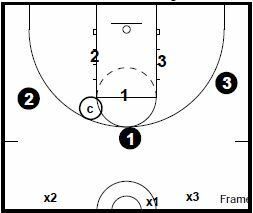 Drill starts with 3 defenders in a line under basket, and coach has a ball. Coach can pass to any player. Top man in line must find ball and close out under control with 2 high hands. x2 and x3 must communicate and find other players. Off ball defenders must be in help, denial, or gap positions. After the 1st stop, top man goes to back of line, and the team must get 3 stops to get out of the drill. Drilling the habit for players not taking the basketball to close out to their gap or denial positions (depending on your style of defense) when rotating out of a trap or a help and recover is an essential defensive fundamental skill. It is not a skill that players pick up on their own without developing the habit through repetition in the defensive fundamentals portion of practice. Rules: every defensive rebound = 1 point, offensive rebound go to defense. Defense must start with 1 foot in the paint, and each defensive player must touch offense. 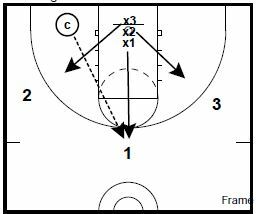 Team must secure rebound the ball inbounds. 1st team to get 3 defensive rebounds wins. The following 4 frames are an example of a specific offensive actions to defend. The key is to select the movements that your opponents use in their offensive schemes. Defending the specific cuts and screens that your toughest opponents run throughout your entire season of practices is more effective than only working on those movements the night before you play. 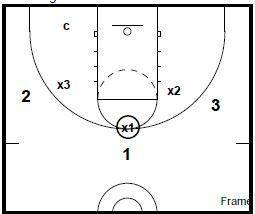 Having the offense run specific sequences helps to make your 3 on 3 drills more gamelike and less like a summer 3 on 3 tournament. Come up with your own list of what you need to defend for the teams on your schedule and work on defending them with your defensive rules. The following four frames are a place to start. Flex action: back screen, down screen. Down screen, cross screen. 1 down screens first, then screens for 3.